People filled the village square in Stubbington for the remembrance event, which has steadily grown in support over the past few years. After the bugler played, the square fell silent, before wreaths were laid by community groups such as the Lions Club and local Co-Op. 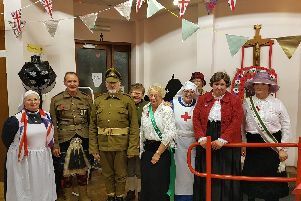 Organiser Peter Fowler, who has run the event for the past 20 years, said: ‘Our remembrance event has grown from small beginnings of 30 to 40 people to today, where the village square was full of people.